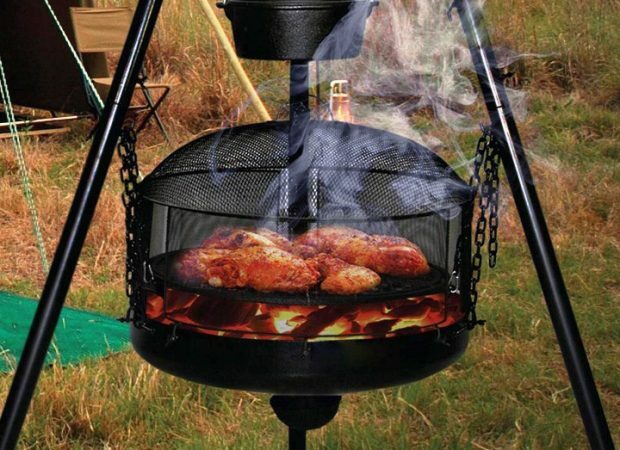 The CAMP & COOK is terrific as a barbeque or keep warm on those cool nights when used as a fire pit. The cast iron fire pan ensures longevity when exposed to the elements and the unique chain fire pan suspension allows easy leveling of the cooking surface. It also saves you the trouble of building a safe fire place on the ground outdoors in your garden, or when you are in the great outdoors! Adjustable chain for camp oven. Flat packed for easy DIY assembly. Bonus camp oven included – while stocks last. Just wanted to tell you how much we are enjoying this product. It is so much safer than the campfires we used to have, & the food is much nicer too.